American aerospace and defence major Lockheed Martin has proposed to manufacture custom-built F-35 fighter jets in India, which its officials say will give Indian industry a unique opportunity to become part of the world's largest fighter aircraft ecosystem. Lockheed Martin's F-35 fighter jet. 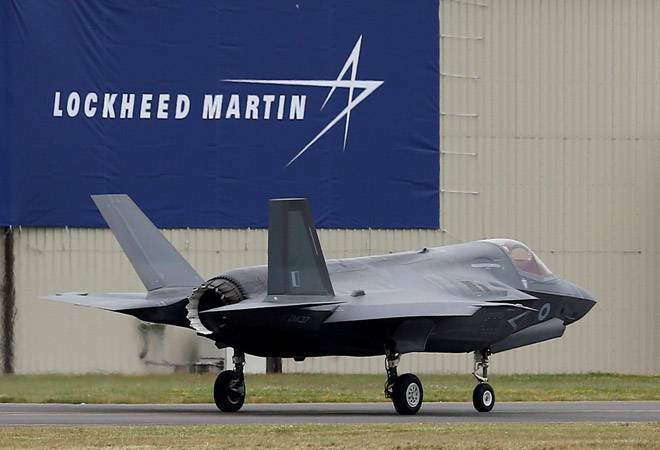 "We plan to introduce two new words into the lexicon of international fighter aircraft manufacturing: 'India' and 'exclusive'," Vivek Lall, vice president, strategy and business development, at Lockheed Martin Aeronautics told PTI in an interview. "India-specific state-of-the-art fighter production in India will be exclusive, something that has never before been presented by any other fighter aircraft manufacturer, past or present. There will also be a significant export market available for Indian-made fighters," he said. Lall, an Indian American who last year was instrumental in the decision of the Trump administration to sell top-of- the-line unarmed drones from General Atomics, in his previous capacity. Noting that the India-specific fighter on offer and its programme's size, scope and success will enable Indian industry to take advantage of unprecedented manufacturing, upgrade and sustainment opportunities well into the future, Lall said the platform will give Indian industry a unique opportunity to become a part of the world's largest fighter aircraft ecosystem. "We intend to create far more than an assembly line in India," he said. Lall claimed no other advanced fourth generation platform even comes close to matching the record of real-world combat experience and proven operational effectiveness. "The fighter being offered specifically to India is uniquely the best state-of-the-art fighter," he said adding that all three variants of the F-35 are single-engine aircraft. Many of the systems used on the India-specific platform are derived from key lessons learned and technologies from Lockheed Martin's F-22 and the F-35, the world's only operational fifth generation fighters, he said. Northrop Grumman's advanced APG-83 Active Electronically Scanned Array (AESA) radar on the F-16 Block 70 provides F-16s with fifth generation fighter radar capabilities by leveraging hardware and software commonality with F-22 and F-35 AESA radars, he added. The APG-83 radar shares more than 95 per cent software commonality with the F-35 radar and more than 70 per cent hardware commonality. Lall said the F-16 provides the path to business relationships with Lockheed Martin, the only company in the world that has designed, developed and produced operational fifth generation fighter aircraft. Technology improvements will also continue to flow between the F-16, F-22 and F-35 for decades, at a fraction of the cost to F-16 operators, he said. The platform being offered provides unmatched opportunities for Indian companies of all sizes, including micro, small & medium enterprises (MSMEs) and suppliers throughout India, to establish new business relationships with Lockheed Martin and other industry leaders in the US and around the globe, Lall said giving an insight into the offer being made by his company. Asserting that approximately half of the Indian fighter supply chain will be common with the fifth generation F-22 and F-35, Lall said the aircraft brings the most modern avionics, a proven AESA radar, modernised cockpit, advanced weapons, longer range with conformal fuel tanks, auto ground collision avoidance capability, and an advanced engine with an extended service life. Even with the addition of targeting systems and two 2,000 pound (lb) class Joint Direct Attack Munitions (JDAMs), the aircraft has a mission radius exceeding 1,300 kms 30 per cent greater than that of its closest competitor, he said. "Many of the advances in systems on the aircraft India would get draw directly from key lessons learned from Lockheed Martin's work on the F-22 and the F-35," he said. "The AESA radar is the result of over two decades of investment, use and experience with AESA technology, and it's fully operational today," Lall said.